5. The following points must be considered when designing a PCB pattern. When building an oscillation circuit with a quartz crystal unit, the following items should be considered. A typical oscillation circuit diagram is shown in Fig.7. And the simplified oscillation circuit in a steady state is shown in Fig.8. To obtain secure oscillation of the circuit, the negative resistance of the circuit must satisfy the following equation : -R | < Re. The above equation is induced. C02 and C03 + CV, as shown in Fig.7., including stray capacitances oftransistors and circuit patterns. Therefore, the load capacitance CL is given by the following equation. If the equivalent series capacitance C1, parallel capacitance C0, and the above CL1 and CL2 are given, the frequency variation range can be induced from the above equation. The "pulling Sensitivity", the sensitivity of an element near the load capacitance (CL), is given by the following equation. under the given conditions of C1 = 16 pF, C0 = 3.5 pF, CL = 30 pF, CL1 = 27pF, and CL2 = 33pF. By applying this phenomenon, the output frequency of the oscillationcircuit can be trimmed to the nominal frequency, by adjusting a variable trimmer capacitor to offset the deviation due to production deviation of the crystal unit and the deviation of components in the oscillation circuit. Although a reduction in the load capacitance (CL) in Equation (6) will increase the device sensitivity, it will also, conversely, decrease the stability. Please note that a reduction in the load capacitance will increase the difficulty in starting oscillation because the effective resistance of the crystal unit will increase, as shown in equation (7). are two extra inductors in the circuit. One of the added inductors (L01: Connected to the emitter of a transistor (Q1)) comprises a frequency selection circuit along with C02 connected in parallel, suppressing fundamental or lower oscillation to stabilize overtone oscillation. This loop consisting of L01 and C02 is called a selection circuit. The condition in order to obtain selectivity is the configuration of the values of L01 and C02 so that the parallel resonance frequency of L01 and C02 is between the requested overtone frequency and the lower overtone frequency or fundamental frequency. Next, the negative resistance of this circuit is to be explained further. resistance -R will be - . In equation (8), if La 0, then equation (3) is induced. 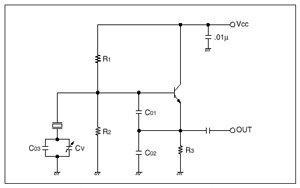 Fig.12 shows a sample oscillation circuit diagram for a pager for your reference. Fig.12 Sample oscillation circuit diagram for a pager for your reference. In order to ensure the stable oscillation of the crystal oscillator, a certain degree of drive power must be applied. Fig.13 shows how the frequency varies with the drive level, the amount of the frequency shift increasing as the drive level increases. the preferred drive power is 0.1 mW or less (max. 0.5 mW). The pattern length from the oscillation stage to the crystal unit shall be the minimum in order to keep the stray capacitance of the oscillation loop to a minimum. When putting other components and wiring patterns over the oscillation loop, the increase of stray capacity shall be kept to a minimum.